Ruger has introduced a modern bolt-gun, the Ruger American Rifle (RAR), that combines smart featurea of popular rifles made by Tikka, Browning, and Savage. The New Ruger American Rifle features a three-lug bolt with short 70° bolt lift. Dual cocking cams are used to lighten the bolt lifting force so the bolt can be manipulated easily. This rifle uses a barrel nut like a Savage, and it also has a safety trigger similar in appearance to the Savage Accutrigger, though the mechanics of the Ruger trigger are different. Currently the RAR is available in a comfortable yet somewhat flexy synthetic stock, with pillars and a deep channel to free-float the barrel. We liked the beefy action, which has as positive tang safety along with a nice rotary magazine. This gun offers many good features considering the affordable price (under $500.00 without optics). We hope Ruger expands the RAR line-up to include a heavy-barreled varmint version with a longer stiffer stock. The RAR will be offered in both short-action and long-action versions. 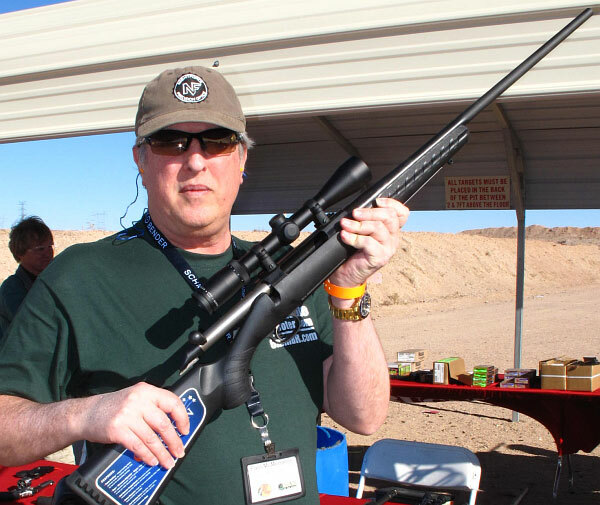 Share the post "Hands-On Test of New Ruger American Rifle in 30-06"
Curious as to why they felt the need to call it the “American” rifle? Aren’t all the ruger firearms “American”? Is there a Ruger “Foreign” rifle to differentiate from? Where are the locking lug seats? In the action or part of the barrel?